I am starting a new monthly linky which will open on 15th of every month for 2 weeks. 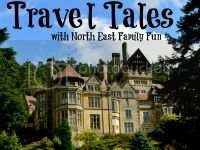 Travel Tales is the place to link up your holiday, days out, short break and road trip posts from anywhere in the world. Old and new posts are welcome. I'm very excited get started! See you all on 15th. Oooh great idea - looking forward to joining in. I'm very excited about joining in with this being that I'm always going away to places, once we get to Easter I shall be off again on my travels as often as possible. Is my daughter a mini-me?